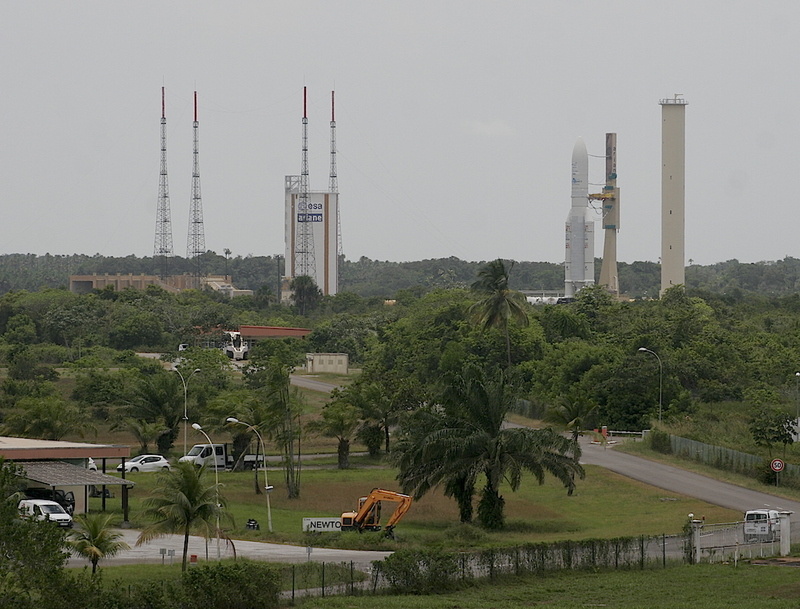 The 180-foot-tall (55-meter) launcher emerged from its final assembly building at French-run Guiana Space Center around 10:30 a.m. local time (9:30 a.m. EDT; 1330 GMT). 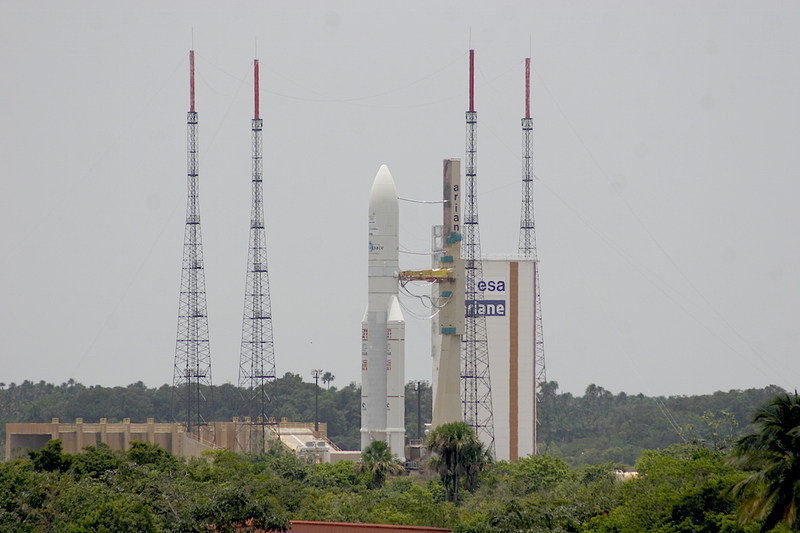 Mounted on a mobile launch platform, the Ariane 5 completed the 1.7-mile (2.7-kilometer) trip to the ELA-3 launch zone about one hour later. 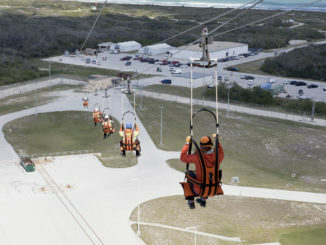 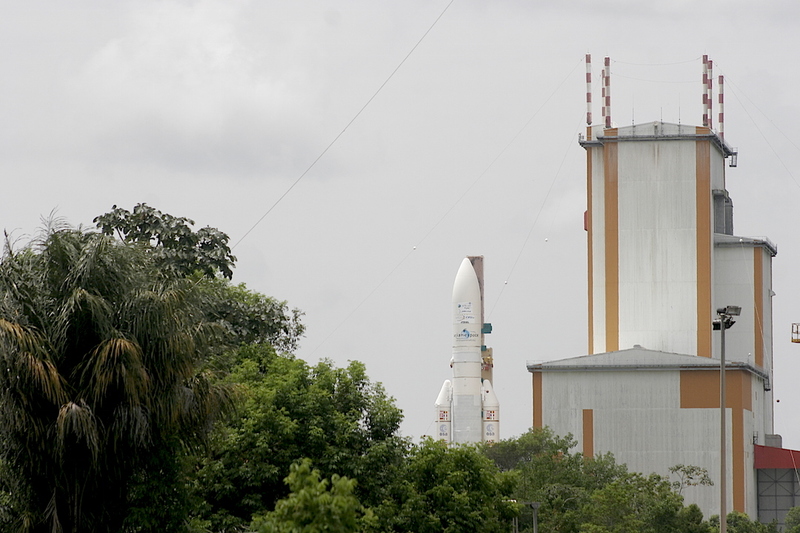 Once the rocket arrived at the pad, technicians connected the launch table to the ground power supply and propellant lines that will feed fuel into the two-stage Ariane 5 during Wednesday’s countdown. 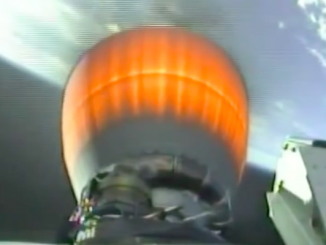 Liftoff with the Intelsat 33e and Intelsat 36 communications satellites is set for 6:55 p.m. local time (5:55 p.m. EDT; 2155 GMT) Wednesday. 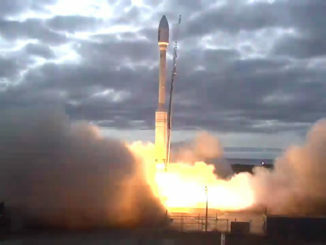 The launch window extends for 45 minutes. 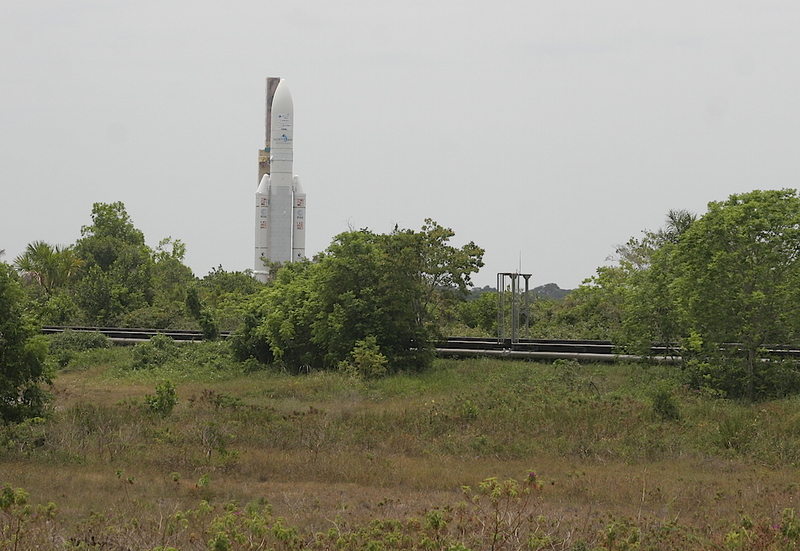 Spaceflight Now covered the Ariane 5’s rollout at the Guiana Space Center, and these images show the Ariane 5 — comprised of two hydrogen-fueled core stages and twin solid rocket boosters — trekking through the tropical savanna during Tuesday’s hour-long rollout. 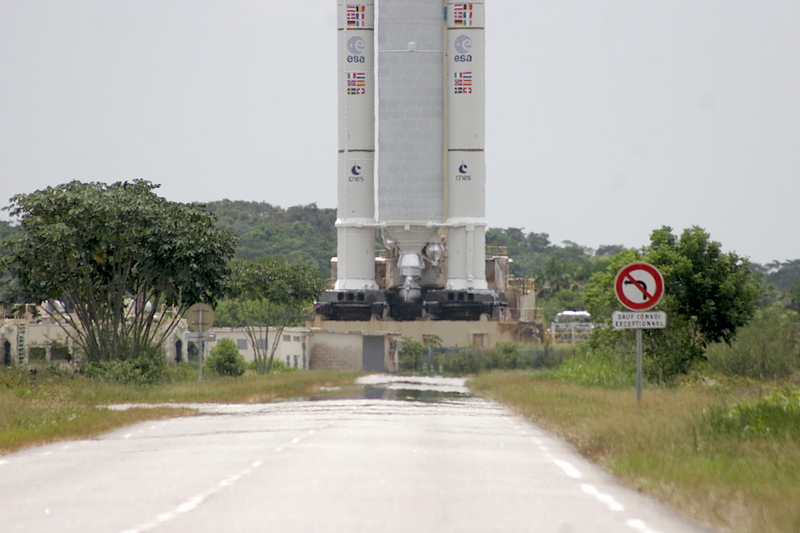 The rocket crossed over the main roadway leading through the Guiana Space Center, then headed for the ELA-3 launch pad, arriving there around 11:30 a.m. local time (10:30 a.m. EDT; 1430 GMT). 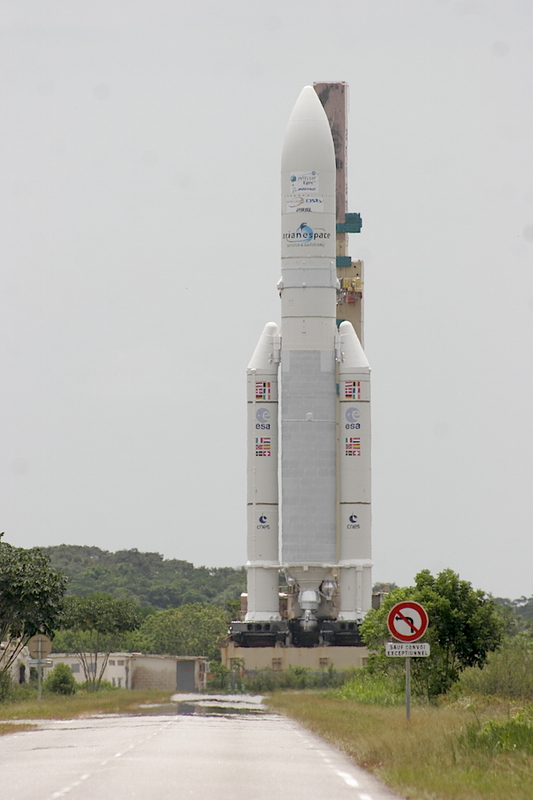 Wednesday’s launch will be the fourth Ariane 5 flight of the year, and the 87th Ariane 5 mission since the European launcher debuted in 1996. 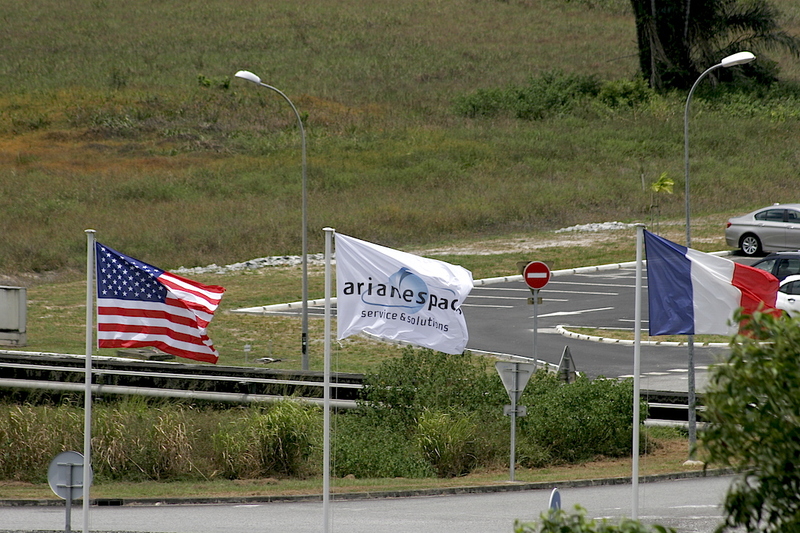 It will also mark Arianespace’s sixth flight of 2016, and 278th mission since 1979.